A remarkably designed coffee house has just opened this month in Kuwait, which has directed the world architectural media to shine its collective spotlight on Oki Sato, a Japanese/Canadian, who founded and runs one of the more eye-stopping design/architecture firms operating this millennium. Great as Oki Sato’s firm Nendo is, he will be the first to praise his clients for hiring his firm. Nothing speaks louder than cold hard cash. Nendo’s (based in Tokyo and Milan) sleek coffee house design in Kuwait was paid for by Kenneth Shoji, owner and founder of % Arabica. Shoji’s operation (based in Kyoto Japan) includes more than 30 stores to date. Most operate in Asia and the Middle East with the coffee retailer poised to open another dozen soon, including first locations in Canada and the U.S. 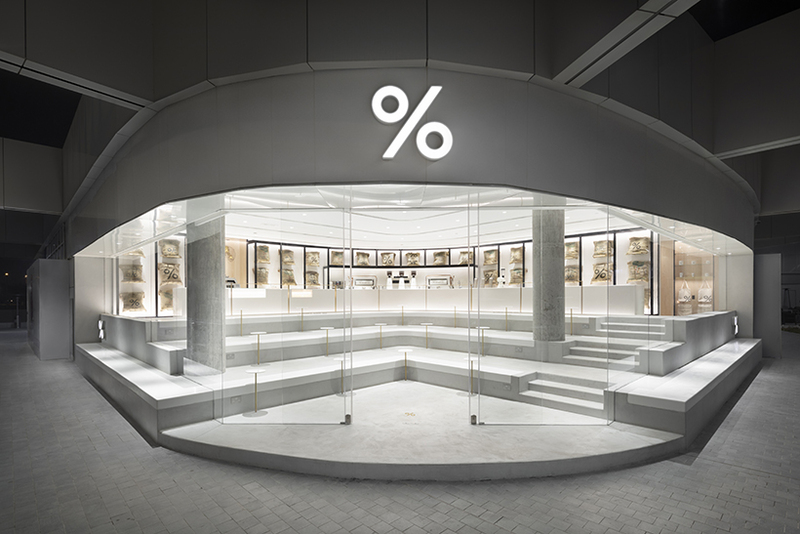 The purpose of this blog is to show Nendo’s visuals for the latest of seven % Arabica units in Kuwait. And, to tune into Shoji’s business acumen from his story on %Arabica’s website. Photography by Takumi Ota is found on Nendo’s archives. See the World Through Coffee. 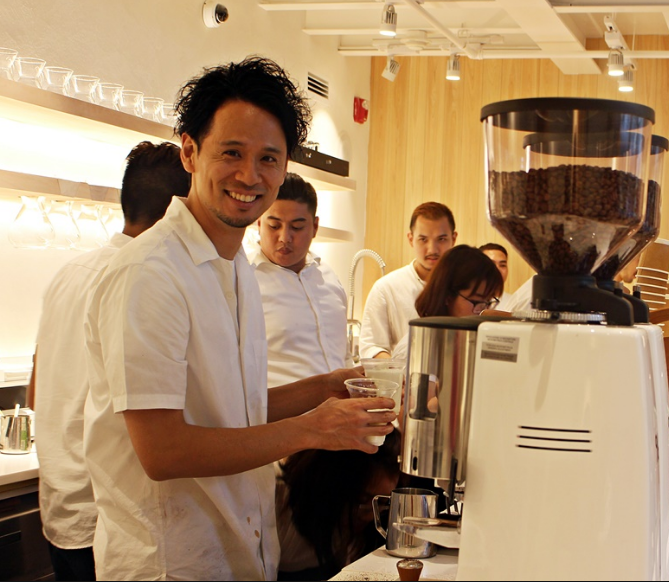 GUEST BLOG / By Kenneth Shoji-- % Arabica is about my love for coffee, design, and seeing the world. My story begins in Tokyo, Japan. Being raised by parents who were enthusiasts of a universal language called ‘’Esperanto”, we would travel abroad every summer to attend a “World Esperanto Congress” held in different countries. My father was the owner of a manufacturing and trading company, and together with his frequent business trips, they would take me overseas whenever possible – ultimately helping to inspire my love of multiculturalism, design, and architecture. Through experiencing different cultures, seeing rich and poor people, happy and unhappy people, I started to wonder who I was, and asked myself what kind of life I wanted to live? After my high school graduation, I moved to California for college. I settled into a snug apartment in Venice Beach and indulged myself in the unique fusion of beach hippie culture. It was during my college years that my love for coffee started. In 1990’s, Starbucks began to expand throughout the country, capturing me with their new coffee culture and serene atmosphere. I spent lots of my days at the Starbucks in Venice Beach, either talking with friends or studying. Who am I? What kind of life do I want to live? I reflected on them over and over. Eventually, I found my answers. ・I want to live a simple and down-to-earth life. ・I only need the basics to be satisfied: food, clothing and a house. ・As my parents did for me, I also want to travel with my children and provide a higher standard of life for them. And my last answer was coffee. I truly need an amazing cup of coffee every day. This is why I founded % Arabica. So to create the best coffee possible, I borrowed money and bought a coffee farm in Hawaii. I also started trading green beans from around the world and became the sole-exporter of a Japanese roasting machine along with the distributor of one of the best espresso machines. 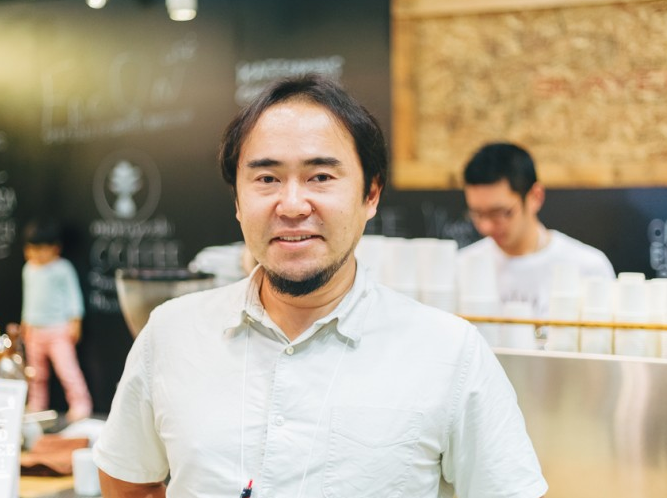 I then spent one year persuading Junichi Yamaguchi, a world champion of latte art, and someone whom I considered to be our ideal head barista. When he finally agreed, we opened % Arabica in the beautiful historic city of Kyoto in September 2014. We only live once, so let’s explore the world we live in, set goals, and enjoy our time together over an amazing cup of coffee.